By adding base drawers to the unused space under the base shelf of CAEM’s M25 shelving system, retailers are now able to create more storage without the need to increase floor space. With the retail market being so competitive, the trend to maintain inventory to meet customer requirements in a smaller space can be demanding. The base drawer is another innovative idea that will help make this happen. These drawers are ideal for storing your excess stock right beneath the bay where you will display them. This will save your staff a lot of time and in addition, it will save a lot of precious storage space in your back room. The idea of less back room and more retail space is obviously advantageous. It gives retailers more options to increase stockholdings and/or product variety. 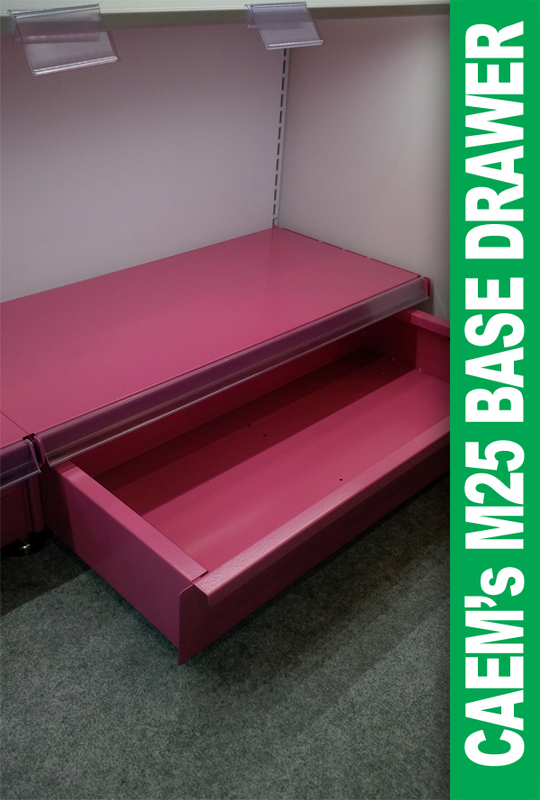 Apart from making it quicker and easier to restock, these base drawers will also allow your staff to spend more time on the shop floor rather than the back room, creating better customer service and better security. It will also make it quicker to respond to customer queries when a product appears to be out of stock. Our one piece base drawers sit on castors rather than relying on drawer slides. This means your CAEM shelving system remains modular and can be used under another bay if and when the need arise. Because of this, our base drawers will be powder coated to match existing kicker panels keeping your retail space looking uniform. The other great thing about removable base drawers, depending on the weight of the stock, the convenience of taking a drawer to the back room rather than having to go back and forth will also be a cost saving. Our base drawers also complement the popular CAEM MediDrawers that are used widely in pharmacies and hospitals. The additional space to store fast moving medication has been beneficial in these industries.